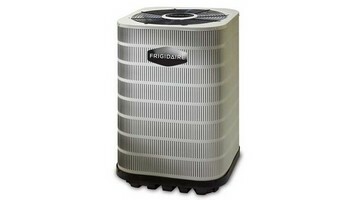 Frigidaire, up to 25.5 SEER, iQ Drive® Air ConditionerThe Frigidaire iQ Drive® Complete Comfort System is quite simply one of the smartest comfort systems available. At almost 80 percent more efficient than a basic system, it can drastically reduce your energy bills while dramatically improving the comfort of your home. Less humidity. More even temperatures. Ultra quiet. For the absolute best in total home comfort, choose the Frigidaire iQ Drive. iQ Drive air conditioners and heat pumps utilize inverter-driven rotary technology. The iQ Drive system’s inverter component converts the electrical current from AC to DC and, in doing so, can almost infinitely vary the compressor and fan motor speeds. Inverter-driven rotary technology is different in that it is almost always running. The unit can modulate anywhere from 40 to 118 percent of capacity, instantly adjusting to exactly offset the cooling or heating demands on the home. Because the iQ Drive unit doesn’t cycle on and off like a traditional system, it saves energy and considerably reduces sound levels. In fact, sound ratings are from 59 to 72 decibels, some of the lowest in the industry. Every unit is triple checked at each manufacturing stage, for an average of 144 quality checks as your unit is built. In addition, all electrical and mechanical components are 100% fired and tested on the manufacturing line. When your contractor arrives, you can be sure that only the highest quality air conditioner or heat pump is being delivered to your home. ~8]RaTSXQ[h`dXTcThe iQ Drive air conditioner and heat pump include swept wing fan blades, absorbing base pans, compressor sound blankets and highly effective mufflers to decrease energy consumption and sound levels. Smooth and practical lines make your Frigidaire unit eye-appealing. All outdoor units are finished with a Silicone protective polyurethane finish that passed a 950-hour salt spray test. This step protects your unit from corrosion 50% more than standard outdoor finishes. The up to 25.5 SEER iQ Drive air conditioner and the up to 22 SEER iQ Drive heat pump were recognized as outstanding values by a leading consumer publication.The power center of an iQ Drive® system is its patent-pending controller. Installed inside the home, the controller “talks” to the outdoor unit, assessing the cooling load of the space and using the information to compute and communicate the ideal speeds to the inverter and indoor fan. This communication occurs multiple times every second for nearly constant interaction. When paired with an air handler or furnace, the controller also calibrates the indoor blower on a periodic basis, performing a load calculation on the duct system and measuring resistance to airflow in order to learn the duct characteristics of the home and perform at optimum efficiency. Frigidaire 20-SEER, iQ Drive® Air ConditionerMoney-Saving Technology: iQ Drive technology delivers premium home comfort while helping you save money. For example, the inverter-driven rotary compressor in this air conditioner helps the unit modulate between 49% and 118% of capacity in five steps in order to exactly meet the cooling demands of your home.Quiet Operation:This unit operates at exceptionally lower noise levels - even down to 57 dBA in certain sizes.Durable Coil Technology: The FS4BG includes an all-aluminum Micro-Channel coil for superior corrosion resistance.Rated for Ultra-High Efficiency: This system meets the requirements for the Frigidaire ecoLogic® green seal – our highest efficiency and comfort designation.Overachieving Efficiency: This model (in certain sizes and matches) exceeds ENERGY STAR efficiency standards for high-efficiency cooling equipment.Highest Quality: This unit goes through our check, check and recheck process. In total, this air conditioner is checked 144 times before it leaves the factory.Homeowners looking to significantly shave money off of their monthly utility bills should go with the FS4BG, 20-SEER iQ Drive air conditioner. Not only will homeowners who select this system enjoy energy-saving operation, but premium home comfort levels and minimum operating noises. Ask your contractor whether the 20-SEER iQ Drive air conditioner is right for your home. Unique: This air conditioner is different from most other air conditioners on the market because it utilizes an inverter-driven rotary compressor. The inverter system allows the unit to modulate from 40% to 118% of capacity to exactly offset the cooling demands on the home. Because it does not turn on and off as frequently as a standard air conditioner, the iQ Drive system can achieve extremely high efficiency levels.Quiet Operation: This iQ Drive air conditioner operates at some of the industry's lowest sound levels – all the way down to 59 decibels.Dehumidification Mode: Because of this air conditioner's iQ Drive technology, it can run longer at lower levels. This provides additional dehumidification assistance and increased home comfort.Innovative Controller: This unit uses the iQ Drive-specific controller for complete control over your indoor environment. Get maintenance reminders, a programmable comfort schedule and additional perks with this premium thermostat.Recognized for Efficiency: This iQ Drive air conditioner surpasses ENERGY STAR's requirements for efficient equipment (in certain sizes and matches).Green: Because of its energy efficiency and high-end comfort features, this unit qualifies for our ecoLogic® green seal.Quality Made: Factory checked 144 times before being shipped.